DIM Cinema and SFU Galleries co-present a double program inspired by ideas raised in Erosion, a new film by German artist Andreas Bunte that was shot on SFU’s Burnaby campus this past January. Commissioned in partnership with Cineworks, Bunte’s film will be shown at SFU Gallery from September 13 to November 18, 2016. The first selection of films considers architecture, its buildings and cities, as a geological formation, beginning with the birth of the quintessentially modernist city of Brasilia as reimagined by filmmaker Ana Vaz. 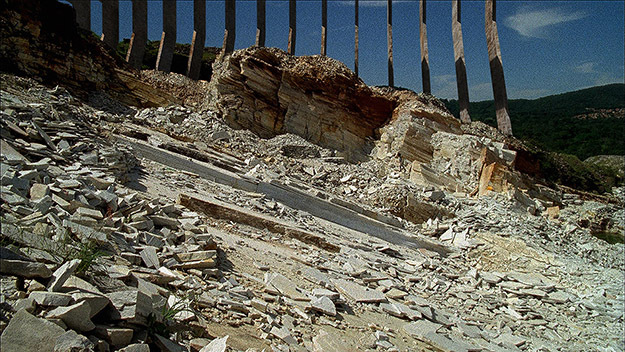 Her film, A Idade da Pedra, leads us into the Central Brazilian Plateau to witness the raising of a monumental structure from its geological foundations, and is followed by Caspar Stracke’s No Damage, assembled from fragments of scenes of New York City from 80 films made over as many years, which reveals that architecture is not eternal but finite. Gordon Matta-Clark’s Substrait (Underground Dailies) explores the city’s hidden passages and spaces, while the final film, by Canadian filmmaker Eva Kolcze, exploits the material and aesthetic connections between celluloid and concrete to interrogate the utopian visions that inspired Brutalism. Featuring iconic examples of institutional architecture in and around Toronto, including the University of Scarborough campus, where David Cronenberg shot Stereo, Kolcze's All That is Solid serves also as a bridge to next month’s screening on October 26.